Thinking outside the box is standard practice here at News360, so when we see another company taking an innovative approach to branded content, we’re eager to hear their insider advice. Some leading brands are early adopters of relationship-building strategies that engage consumers and enterprises through earned and owned marketing channels. Enter: Stephanie Losse, Dell’s Managing Editor of Global Communications. We sat down with the boundary-pushing leader to talk about her company’s owned content channel, “Tech Page One,” and what it takes to do content marketing right, from ideation to maximizing investments. What influenced Dell’s decision to start investing in content marketing initiatives like Tech Page One? 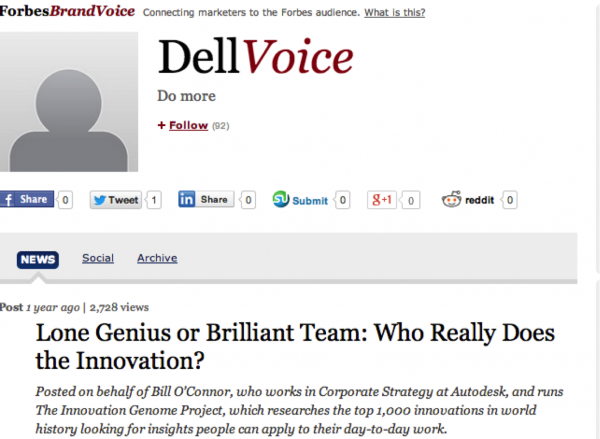 When I joined as Managing Editor, Dell had a Forbes BrandVoice page, a traditional add-in that went with a large ad buy. I used the page to make experiments to demonstrate that sponsored content could be editorial rather than just advertorial. By the time the Forbes engagement ended, we were eager to publish on our own channel and use it to draw people into our ecosystem. Content was nothing more than a deepening of the conversations we were already having with customers via social media, [so] it’s more effective to treat content as a service we provide to our customers. We believe there’s a place for paid media, including native advertising. That’s what led to the launch of Tech Page One. The topics we write about are interesting to people interested in Dell. How do you measure ROI for Tech Page One? Almost immediately, [Dell’s Tech Page One] was far more successful than it’s predecessor, the Solutions Center homepage, driving more engagement with lower bounce rates. Another metric was earned media [and] we had some early wins with our content being republished by third-party sites, not just on core Dell topics, but also with stories at the intersection of tech and life. That type of content gives readers relief from the technical, but also prompts them to share it. It’s easier for Dell to build a content strategy than a company less steeped in social media, something that’s part of Dell’s DNA. We just extended those measurements to Tech Page One. 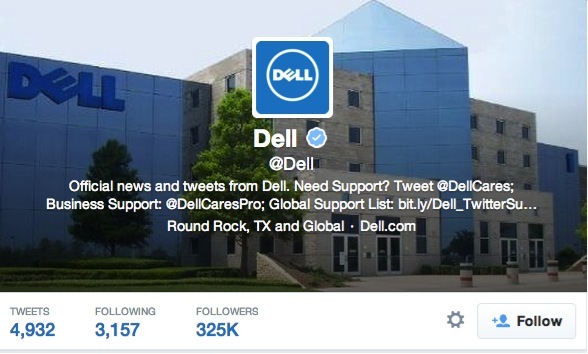 How do you quantify ROI from Tech Page One to Dell’s CMO? People don’t think of Dell as a very innovative company, [but] those same people are very interested in what Dell has to say about innovation. One of the things they’ve gotten from us as a brand is that it’s not so much about our solutions and services, but how our products help customers do what they need to do. In an interesting turn, our innovative content marketing has actually boosted our reputation for innovation. Our CMO is very satisfied with that result because it’s about overall brand reputation. We’ve [also] received a lot of external affirmation of our content strategy. Is lead generation part of the content marketing ROI? The ultimate goal is lead generation, but this type of content is at the very top of the marketing funnel. The question is more, ‘does [our content] pull them deeper into the funnel and pull them deeper still?’ [The goal is to] connect the dots between content at the top of the funnel and content that goes deeper, like a white papers. Our audiences are hungry for white papers. They want deep, detailed content that helps them solve a problem. When I’m asked how much lead gen was generated by a New York Times paid post, I have to explain that’s not the real goal here. [Instead], we have to recognize where we are in the funnel and what that kind of engagement will get us. How do you balance branding with thought leadership? Very strictly. We followed the example set by the Intel Free Press and took an editorial approach. We have a better than 80:20 editorial-to-promotional mix [and] our content calendar dictates that we can’t post more than a certain number of promotional stories. If someone wants to write about a trend we uncovered at an analyst conference, we have to wait until a spot opens up. 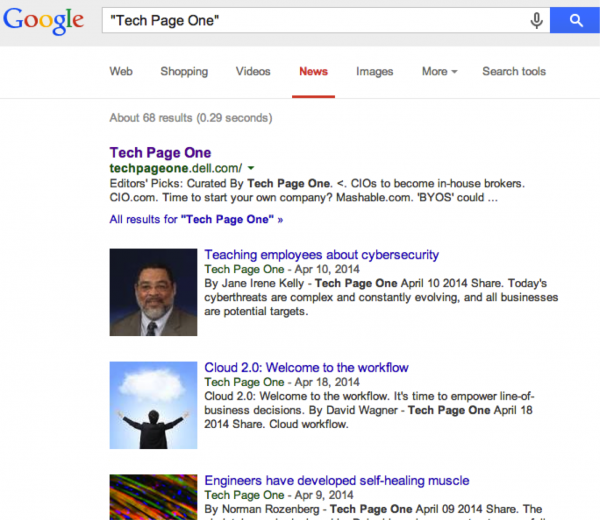 The payoff is that, this past February, Tech Page One was ratified as a news site by Google search. The first week, our content was in the top three stories, along with the New York Times, for two of the three topics we tried—even coming out ahead of the Times on one. A search-driven strategy is akin to an audience-driven strategy and is equally desirable. What content works best for Tech Page One and its readers? Our audience is most interested in solution-oriented content (how you protect your company’s data) or content about tech culture. One of our most successful stories was about 3D sonograms for blind mothers—something Dell isn’t even remotely connected with. It was republished everywhere with deep links back to Tech Page One. Another example is a recent story about MOOCs, “Massive Open Online Courses”. The pieces themselves are not about enterprise products per se, but people who are interested in tech are interested. Is content marketing separate from social media or is it part of social media? Social media amplifies our content marketing; it’s much more effective for our content plan. If we have a story we want to give additional gas, we send it to the social media team as a potential piece for @Dell or our social pages. It’s our promotional tool, regardless of budgets. Which brands do you recognize as being leaders in branded content? I lust after Coca Cola Journey—they turned their entire corporate page into a magazine. American Express Open Forum inspired us. They publish authentic news-you-can-use content, but don’t make it exclusively AmEX-oriented. If they publish a story about the top 10 restaurants in Belize, it’s not the top ten restaurants that accept the American Express card. We have a goal to eventually exceed their numbers, so we’ve modeled ourselves after them. And of course Red Bull. The fact that they consider themselves a media company that makes beverages instead of a beverage company that invests in media just inspires me. What are other brands not doing correctly with their publishing efforts? [Some brands] think their content should be about themselves. To a degree, they’re correct. Someone who wants to find out about them is in the right place. But if you want to offer your audience something for the purpose of engagement, I don’t think it works very well. Where do you see branded content going a year from now, two years from now? But a traditional relationship between publishers and brands can still be a healthy ecosystem with a separation of church and state. This native advertising chapter is a way station to where we’ll go. When traditional publishers truly recognize digital disruption, they’ll recognize that their sites are no longer hubs. Even when I read The New York Times, I’ll go into their ecosystem, maybe read a couple other things, and move on. If you affirm that, instead of brands trying to turn themselves into publishers, we want great journalists to publish original content sponsored by us that appears on our site. The publisher will be the aggregator of their own content, scattered across the web [and] instead of Dell’s ad next to a story the reporter wrote on the publisher’s site, that story publishes onto Dell.com. That’s where I think we’re going eventually. But that requires a giant leap in terms of a distribution model, not to mention an enormous degree of trust that church and state were preserved. You provide an interesting perspective, Stephanie. Here at NetApp we also see Nirvana as being the point when we become the prominent choice for a reader. However, as I’m sure you know, it takes time to earn the interest and trust from the reader before they’ll pick your place as the primary spot for information. I hadn’t thought about your prediction that the content hub could become the brand’s property vs the media outlet. That’s interesting. Red Bull has hence bought a media company. They wanted to turn your prediction into a lucrative business model. I’m confident in us marketers making something like that happen. I also think that in many cases, where the reader goes is not as important as how omnipresent your brand is in their mind. The “place” starts to become less relevant when your story does it’s job. What I see as the opportunity is to negotiate the cost of content based on it’s currency. If your brand can generate big results, the publisher should want your content more for the results than for the money. I’d love to have lunch and chat more.